When I first came to Paris I was determined to find the best croissant in the city. But the longer I lived here, and the more croissants I tasted, the clearer things became. There are several boulangeries here that I would classify as having the top tier croissants. Of those top bakeries differences come down to personal preference. Do you prefer a sweeter pastry? More substantive on the inside? How flaky? Even external factors like weather and chance affect the outcome of these pastries: absolute consistency is impossible and is at odds with artisanship. I couldn't pick just one place. My tasting methods were efficient: there were no left overs. (I don't want to talk about the health sacrifice I gave to complete this delicious study.) I tried to keep things as consistent as possible by visiting all the bakeries before 10am; nearly 50 of them, in fact. 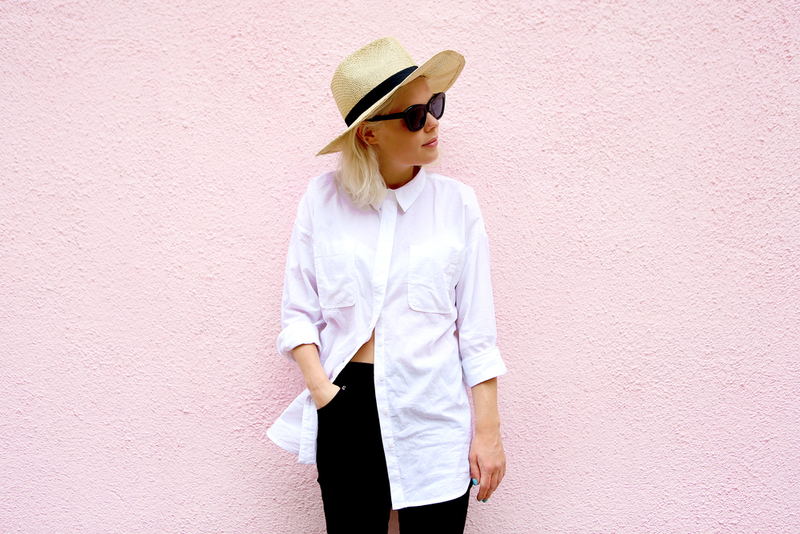 If it was raining, I returned when it was sunny. I visited each bakery at least twice. 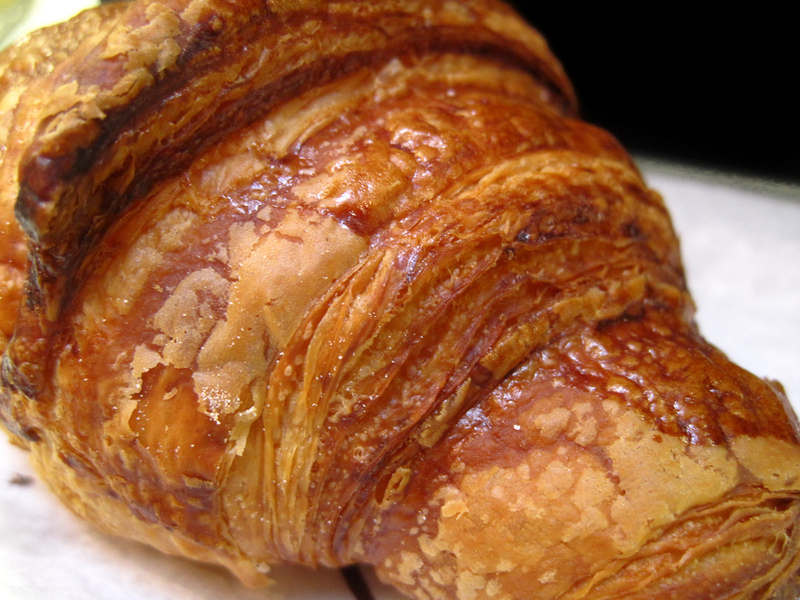 So, listed below are the five bakeries I believe to have the best croissants in Paris. They are in no particular order. These croissants are big and bulky; yet, light and airy. Thick, dark caramel bands wrap this pastry with blisters of tan revealing just how thin each layer is. 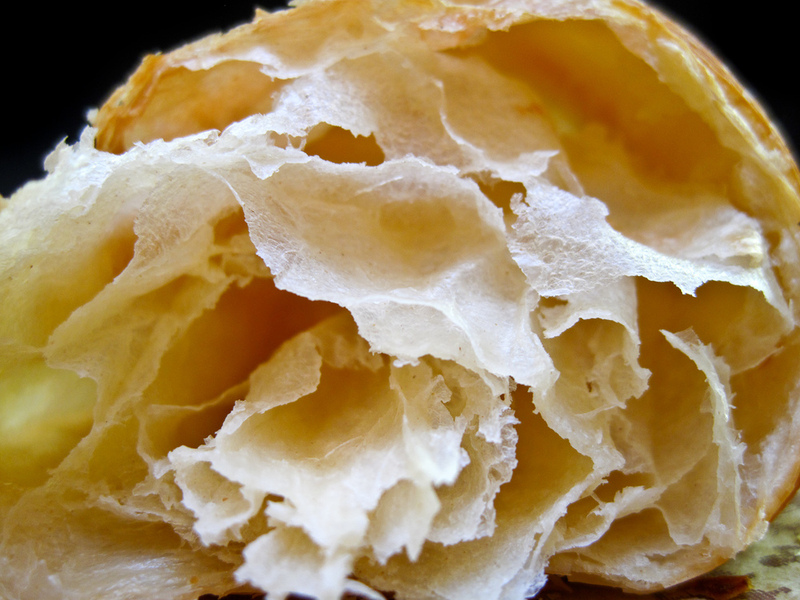 A side view immediately shows that despite the croissant's bulk, it was still composed of thousands of paper thin layers. The croissant was sturdy; though, squeezing the exterior would have broken the shell rather than spring back. There was a very strong scent of toasted butter. This croissant was very messy, and tearing off segments resulted in a distinct crackling sound. Despite the shell's dryness, however, the inside was cavernous and moist with spiral-shaped webs revealing the inverse of the piece I'd torn out. The flavor was salty with a hint of sweet towards the end, followed by toasted butter. This is one of the best croissants I've ever tasted. Almost hard to tell whether it was salty or sweet since the two flavors were in perfect balance. The shell had structure and protected the croissant's shape despite my 30-minute journey home through the Paris subway system. 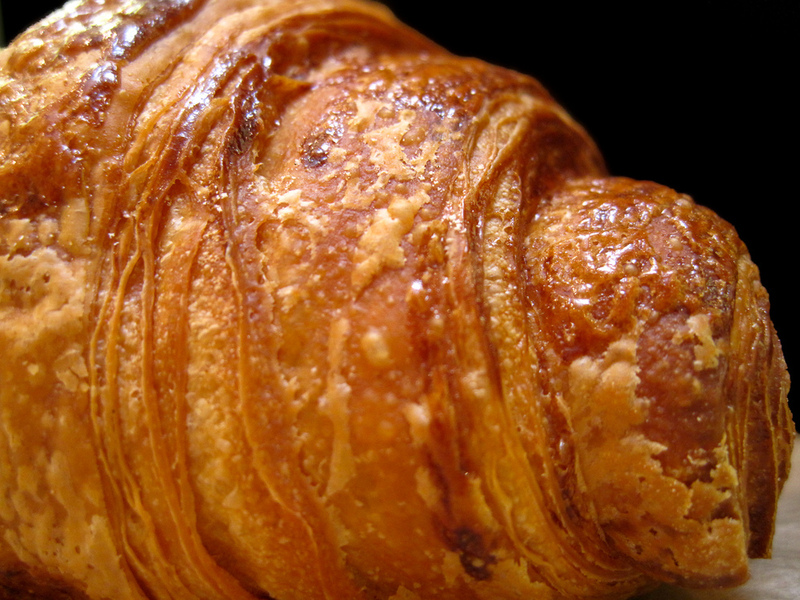 My guess is the firm shell locked in moisture allowing the croissant to stay fresh throughout the entire morning. The inside was a nice mix between a hollow cave and a honeycomb, ensuring that the crust's texture was crispy and pronounced; but not dominant. The ends of this croissant were blunt, making each bite texturally equal: there was no bad bite. 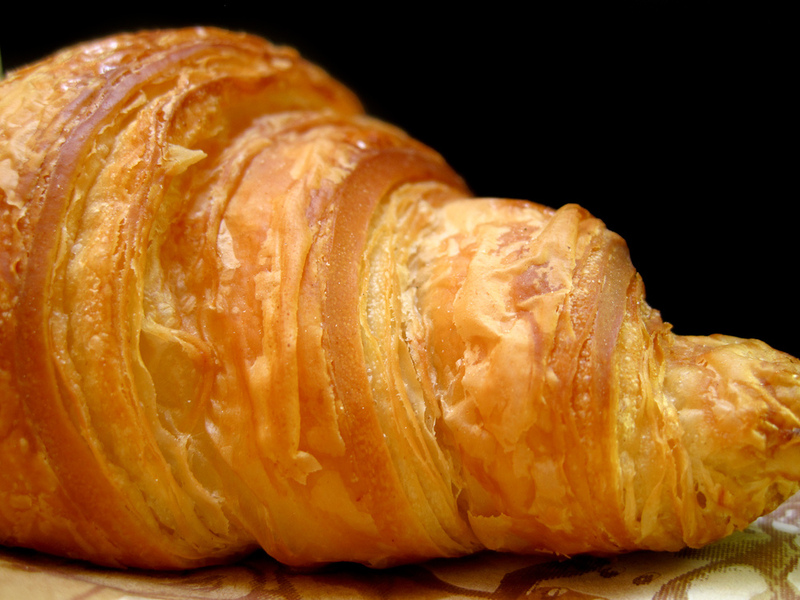 Thierry Renard won the Concours du Meilleur Croissant, Ville de Paris 2008, for having the best croissant in Paris. It's easy to see the elements that make this croissant so impressionable: it's ultra-light with thin flaking layers, has an airy soft interior with a rich flavor of butter, and smells lightly toasted. The exterior is diamond-shaped with one side slightly more pronounced as a boomerang. The color is a light brown with random strips of shiny dark brown showing where the pastry was glazed with butter. The consistency is fluffy and the pastry looks more like it was rolled than folded: it's very round. The thin and crispy shell holds together pretty well as flakes do not brush off easily. When broken, however, make sure you have a napkin underneath to catch the thin small pieces that come off. Inside is sort of like a collection of flower petals: the glutunous webs stretch across the ringed interior, each waiting to be pulled out and enjoyed. The texture was chewy, and the inside tasted of buttered dough with a slightly sweet, rich butter aftertaste. These croissants were very enjoyable; but they could have been even more enjoyable had they been cooked just a bit longer to eliminate the doughy interior. This croissant's outer shell is a very good balance between ultra-thin and slightly thicker, bringing the best of both worlds into a single pastry: thin enough to flake yet thick enough to absorb maximal butter. The interior was beautiful, and the thin mesh of butter scented rings gave the croissant substance, while still keeping it feathery and texturally interesting. 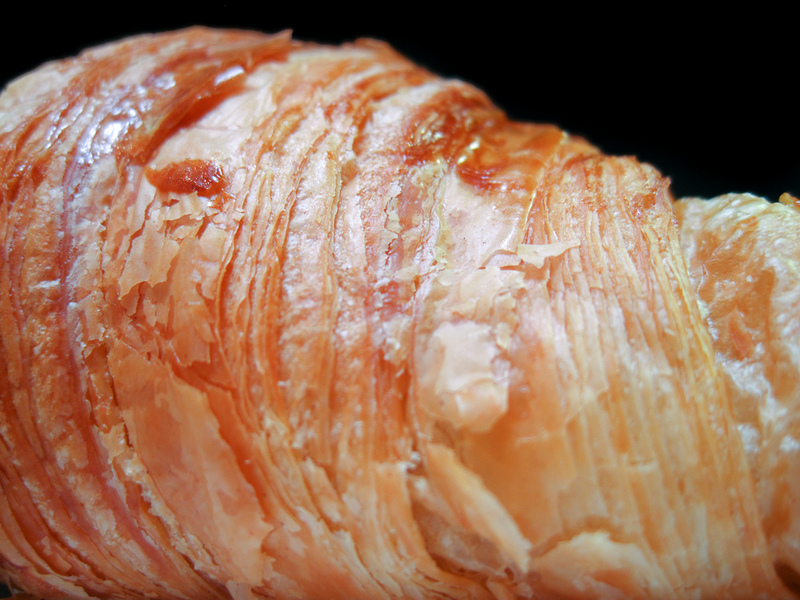 I read about Frédéric Comyn from Chez Pim, who says this is the best croissant in Paris. It also happened to win the Concours du Meilleur Croissant, Ville de Paris 2007. Pretty strong recommendations. Strong enough that despite the terrible weather I trecked out to the last stop on the 4, Porte d'Orléans, to taste for myself. Sure was worth it. 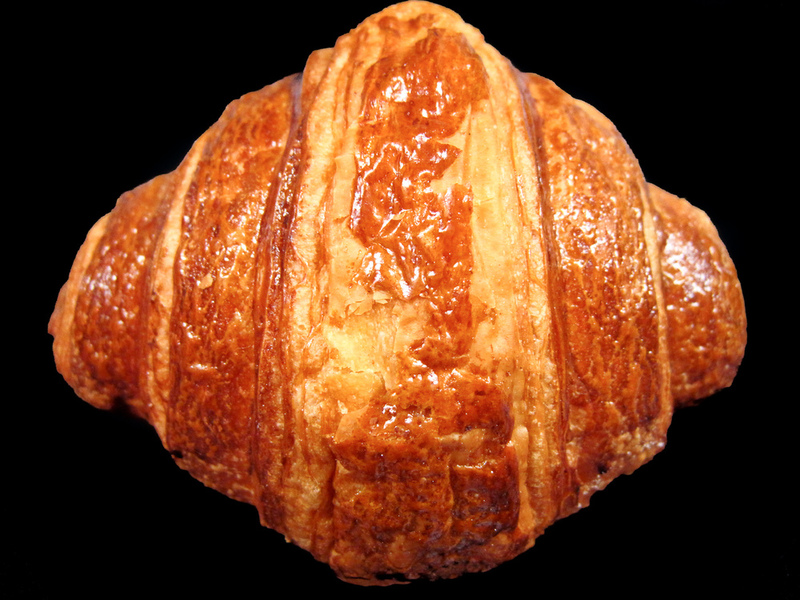 This croissant has a very distinct spherical appearance; it is nearly as tall as it is wide. Its center arcs upwards like a crescent instead of sideways, lifting off of the table. It is quite tall, and perfectly symmetrical. 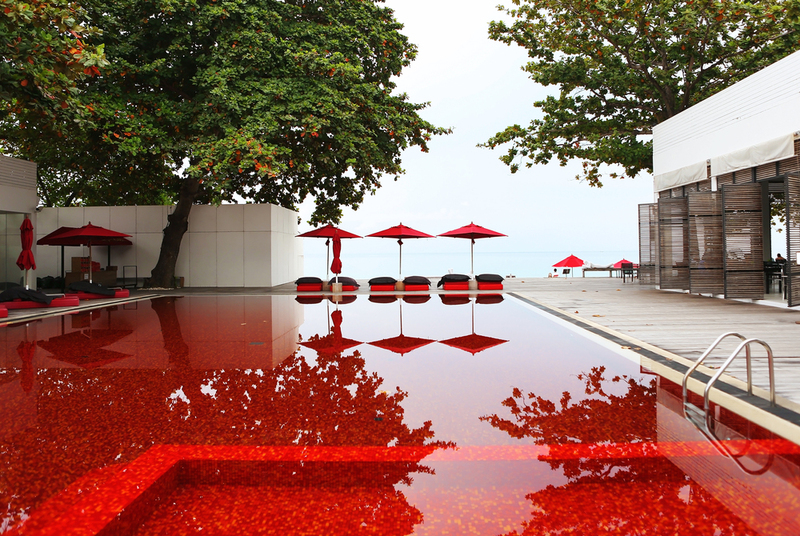 The surface is shiny with copper and bronze tones. A view from the side reveals a spiral with hundreds of fine layers. The outer shell is slightly thicker than paper which gives it a crispiness that is almost moist, since there is more volume to absorb butter. Dispite the thicker shell, this croissant is not greasy. When it fractures, it leaves behind large pieces with thick flakes. This was not a delicate croissant; rather, it was substantive and strong. The interior is cavernous with large webs of pastry stretching between sides of the outer shell. The flavor is of salt and toasted butter. The outside surface tastes sweet in some parts, as if it was lightly brushed with butter containing a hint of sugar. This croissant was wonderfully different: hundreds of light layers thick enough to absorb butter without feeling greasy. The salting was significant making this pastry perfectly straddle the line between savory and sweet. The inside was hollow with pronounced layering. This bold croissant needs absolutely nothing else to be enjoyed, no confiture, no coffee ... nothing; it can stand completely on its own. Maybe it's a good thing Frédéric Comyn is a bit out of the way. Otherwise, I'd be 500 lbs. I learned about Le Quartier du Pain from my bibleParis est à Nous - Paris Gourmandises guidebook which says that Le Quartier du Pain has the best croissants in the city. It's certainly possible. The diamond-shaped croissants here have an inflated appearance, and are slightly larger than average. However while large, they are still essentially weightless since these croissants are light and airy. The first thing I noticed were the hundreds of layers clearly visible on the surface, some were shiny and brown, others were matte and bronze colored. The croissant had a very strong smell of toasted butter, the 30 minute subway back to my apartment holding this bag was torture. It's hard to call the shell of this croissant crispy since it's ultra thin, I think flakey is a better word -- much like the brown skin that surrounds an onion. Because of the ultra thin shell, this croissant did not shatter but flaked all over the place: it was very messy. 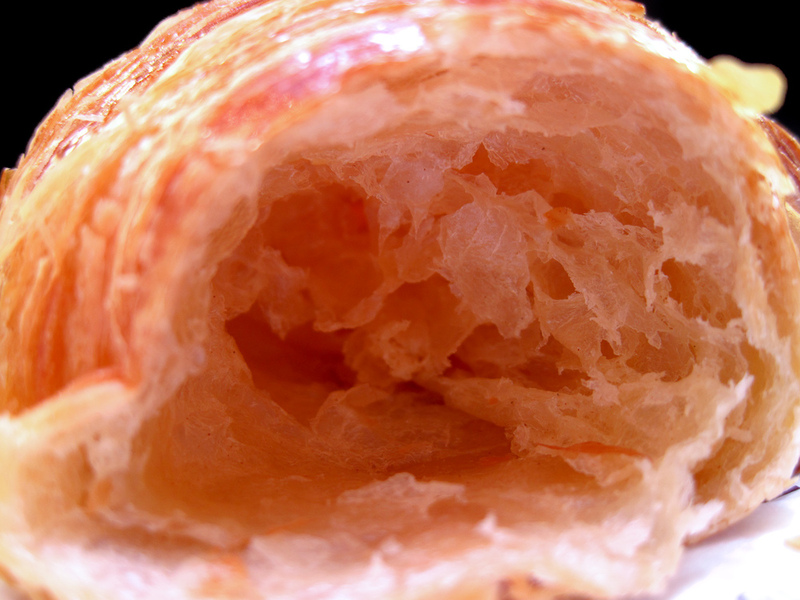 One edge of the croissant was minimally frayed; but since the croissant was uniformly thin it didn't add any additional textural element to the exterior. 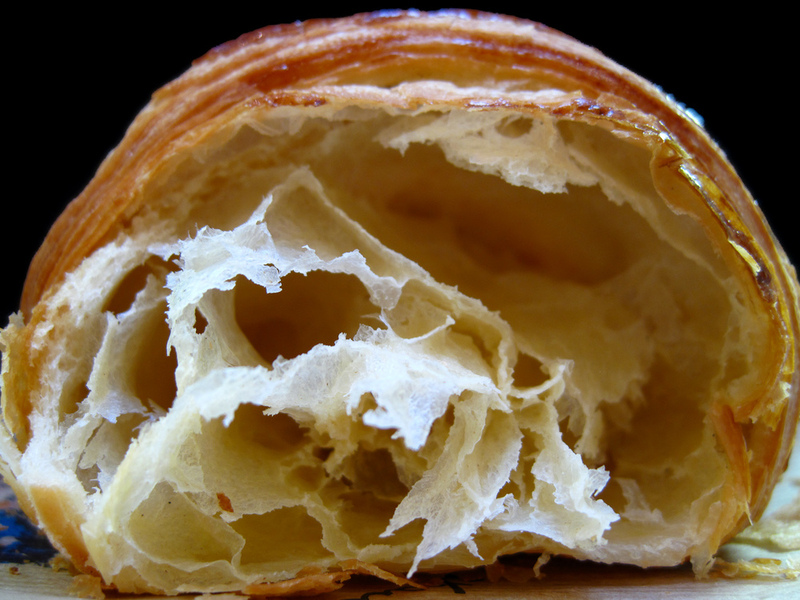 The inside is chewy and fluffy, and pulling a piece does not uncoil the croissant rather tugs at the surface from the inside -- that's how thin this is. The flavor is of butter, but not overly toasted or salted. 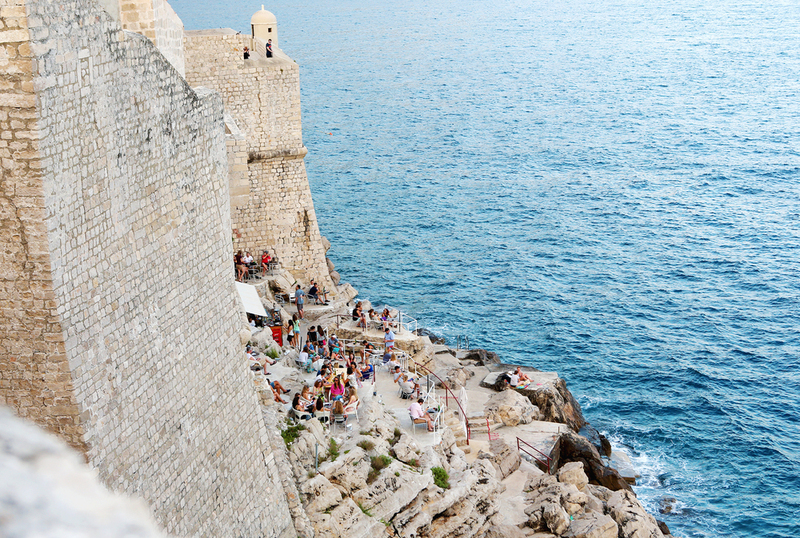 This would be excellent company with a coffee. I very much liked this croissant for its texture, weight, and smell. It has significant body on the inside, so for those who seek something crispy this is not going to fit the bill. I found the flavor gentle, which would be perfect if eating this pastry with a hot beverage or confiture. The only thing to be aware of is that it is greasy: eating with several napkins is obligatory, unless you are next to a sink to constantly wash your hands. But this croissant may be the single most masterful pastry I've seen in terms of skill -- there is no other croissant whose layers are so cleary detectable and thin. It is truly a work of art. I first read about the croissants at Au Levain du Marais from David Lebowitz, who says that this is the best croissant in Paris. Frankly, it might very well be. 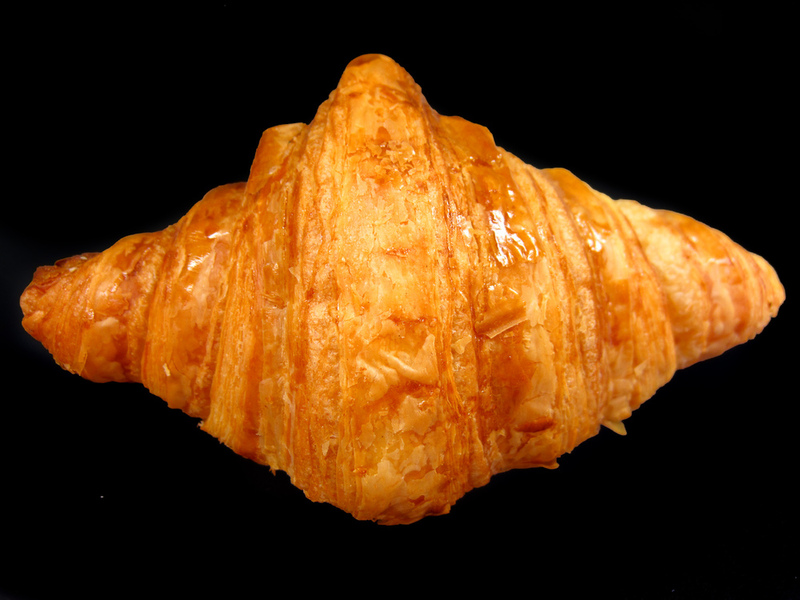 The croissants from Au Levain du Marais are not so crescent shaped as they are diamond shaped. 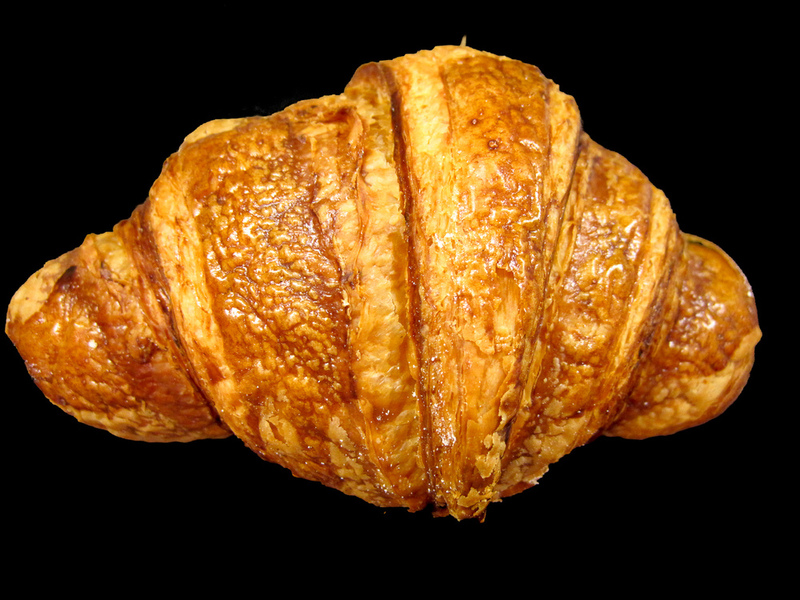 With the exception of fanned out frills on one end, these croissants are nearly perfectly symmetrical. The croissants have beautiful broad stripes of pretzel brown and amber that alternate the surface. Each tip has a beautiful fanning of layers making it clear just how much work actually went into this edible art. The width gently tapers off at each side, without any striking changes in size. When I first tried to pull out a piece, I had trouble grabbing hold ! My hands crinkled through the soft and delicately crispy shell, much like crumbling tissue paper used to package gifts. I realized more care would be necessary, and I began to tear off a piece with as little force as possible, so as not to destroy the texture. The fanned end was light and crispy but not dry, more like a butter wafer. 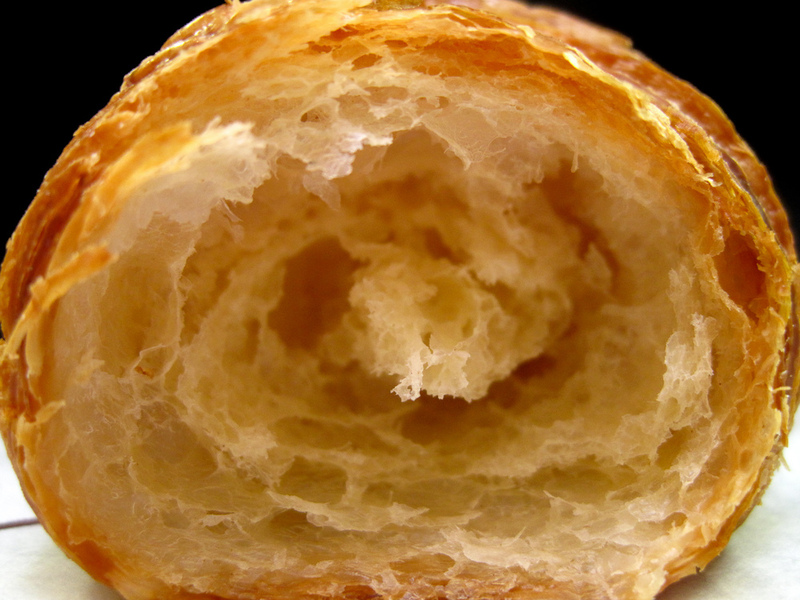 This was the first bite of the croissant I took, and my favorite -- each part of this croissant has a different texture, and since none of these parts are dry, each is absolutely rife with the flavor of toasted butter with a hint of sugar and salt. The inside of the middle is very soft with clearly visible layers of rings. Stretched across these rings were thin webs of soft dough, full of moisture. This was a very messy croissant to eat, since it shattered all over the plate. Some parts of the outer shell tasted sweet -- hard to tell if they were sitting next to some other sweet pastries or if the shell was lightly brushed with some kind of sugar. Regardless, absolutely delicious. It was a bit of a travel for me to get to this bakery; but shortly after finishing this croissant I hopped right back on the subway to get a couple more. These croissants were wonderful.